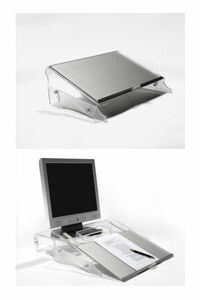 The Bakker Elkhuizen FlexDesk Adjustable Writing Surface can extend 6.25" towards you when you want to use it. 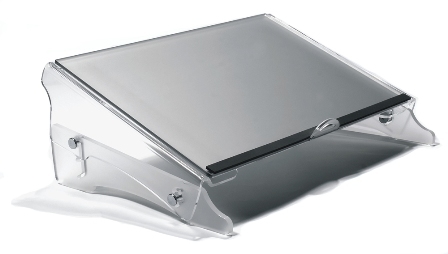 The FlexDesk is made of clear acrylic; the easel is a sturdy heavy-duty acrylic that ensures a solid smooth writing surface. 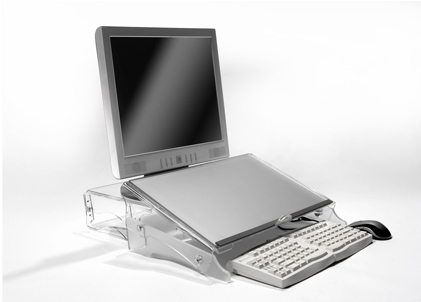 A thin hard foam strip prevents documents from sliding off the surface. A heavy magnet 'lock' keeps the easel firmly in place when positioned upward. 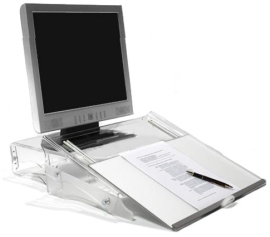 The FlexDesk incorporates an adjustable writing surface that simplifies making notes on source documents while at the same time using a keyboard.